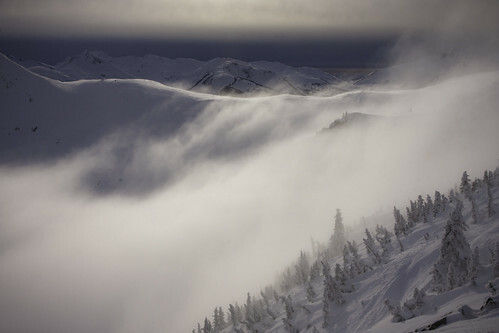 The 09/10 season at Whistler Blackcomb was exceptional to say the least. The snow was excellent and the “Olympic Aversion” kept the mountains empty most of the time. There were many powder days where you’d ski straight on to every lift. And with the tremendous snowpack, I skied-out to Creekside on Whistler’s final day of operations. It’s hard to pick just one day from last year as being the best but one does come to mind. Instead of a day with the the deepest snow or with the best friends, my best day was January 3, 2010. I planned on riding solo so I could capture some timelapse footage. “No friends on a powder day” and ever fewer are willing to stand around in one place for a couple hours on the top of a mountain in winter. It wasn’t the greatest bluebird day but I intended capture some of the cloud movement. Using a DSLR camera, a tripod, lenses, and remote trigger I set out to capture the Harmony zone on Whistler Mountain. After scouting a couple different areas, I set up then waited patiently as the frames clicked by. Here are the results from that afternoon. Besides learning a bunch about time lapse photography, which I plan as a separate post, I also managed to take some of my favourite on-mountain shots that day. The clouds were layered with a pink hue and the lighting was soft. Here is one of those shots. I had plenty of great days last year. Each one for different reasons. January 3 stands out for me as one of the best because I could just be up there and take the time to look around. Enjoy the atmosphere and relax in anticipation of how the photos were going to turn out. Here’s to having many more days like that one this year. This entry was posted on Thursday, November 18th, 2010 at 14:24 and is filed under Skiing . You can follow any responses to this entry through the RSS 2.0 feed. You can skip to the end and leave a response. Pinging is currently not allowed.